GUANGZHOU, CHINA, March 18, 2019 /24-7PressRelease/ -- HAVIT has just announced the release of their latest product, Upaya Bluetooth Noise Cancelling Earbuds. These earbuds offer the height of audio quality for those who want an uninterrupted listening experience, whether they are listening to music while jogging or activating Google Assistant or Siri with a command. The new Upaya Bluetooth Noise Cancelling Earbuds are comfortable with an ergonomic design that makes it easy for the earbuds to be worn on the go. The streamlined design yields a lightweight product that's easy and comfortable to carry. As it stands, customers an get Upaya Bluetooth Noise Cancelling Earbuds in a sleek charcoal color that is versatile and unisex. HAVIT's Upaya Bluetooth Noise Cancelling Earbuds feature CVC 6.0 Active Noise Canceling technology and high definition sound quality for an exceptional audio experience. Unlike passive noise cancelling that relies on physical blockage to reduce noise, the Upaya emits anti-noise sound wave to neutralize low to mid range frequency noise in the environment (e.g. wind, remote traffic sound, white noise), allowing listeners to enjoy clearer sound while still hear mid to high range sound that might be important (e.g. car horn, talking sound). Clear sound recording is also a feature of these powerful yet compact earbuds. A long lasting battery means that wearers get the most from each and every charge. Customers from around the world who want a better listening experience can now order their very own pair of Upaya Bluetooth Noise Cancelling Earbuds for $59.99 USD from HAVIT's website. Several other currencies are also accepted at the website. 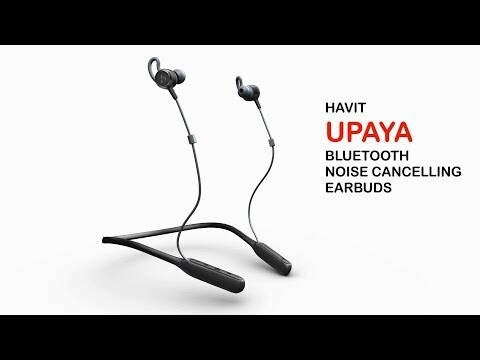 The Upaya Bluetooth Noise Cancelling Earbuds are a part of H Series - HAVIT's new product line that targets sports enthusiasts. Besides Upaya, the trending G1 Series True Wireless Earbuds are also featured in this category.